Yamaha Motor Wins First “German Design Award” International Design Competition　— Flagship YZF-R1 Captures Fourth Design Accolade — - News Releases | Yamaha Motor Co., Ltd.
IWATA, October 24, 2016—Yamaha Motor Co., Ltd. (Tokyo: 7272) announced today that its flagship supersport YZF-R1 model has been selected as the winner of the transportation category of the “German Design Award” competition. This achievement represents Yamaha Motor’s first nomination for this Award, and was selected as a first-time category winner from among over 4,000 entries. 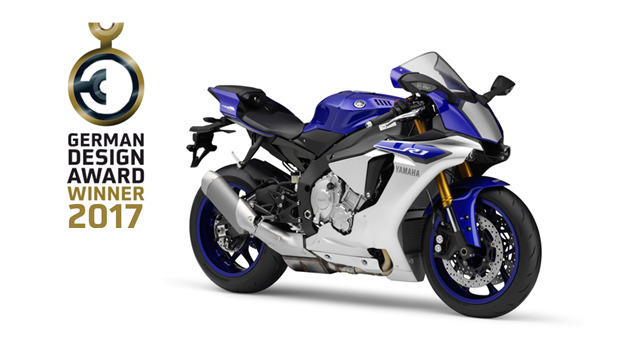 In addition, the German Design Award marks the fourth design award received by the YZF-R1 (2015 overseas model), following on from the Good Design Award 2015, iF Design Award 2016, and the Red Dot Award: Product Design 2016. In the German Design Award, the German Design Council recommends products from around the world which have already been evaluated as of a high design standard. Only after receiving that recommendation can an application be made for this internationally-prestigious design award. The title of winner is an award of excellence bestowed only on works chosen by the jury from within each category. The new flagship supersport YZF-R1 model was developed to allow riders to experience the technical concepts of a MotoGP YZR-M1 machine, and comes equipped with the potential for a circuit-level top speed.